Any runner knows that the running community is a social media community. Running and training equals hours of our lives on beautiful trails where we feel at our best, so it’s only natural for us to want to showcase what we are doing out there with a few selfies and photos of our favorite trails. In turn, we runners get motivated and inspiration from seeing what other runners are going through and we want to pass that along. Last week, I was in DC visiting friends and interviewing for new opportunities when, as I was lacing up for an early morning run, I realized that I didn’t have very many photos of myself running along the National Mall or any of the other trails where I had spent hours of my life training to run the 2011 Marine Corps Marathon, 2013 Goofy Challenge, and 2013 Rock ‘n Roll USA Marathon. 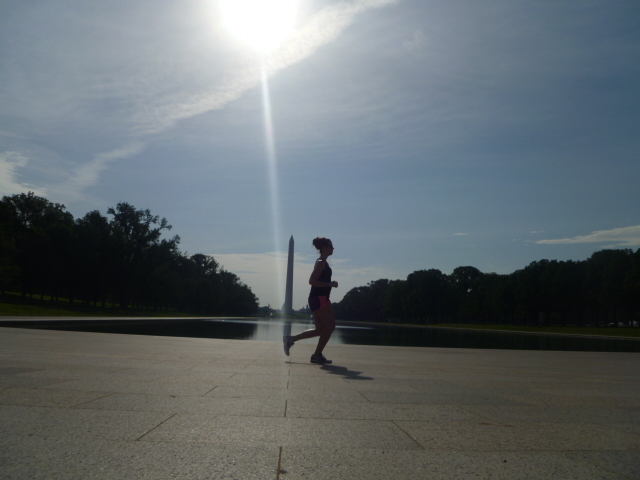 I can still remember my best training runs on the National Mall– the spot in front of the Hirshorn Museum where I cried upon finishing my first 18-mile training run or, at that time, the furthest I had ever run, looping my fifth time around the tree-lined path off the Reflecting Pool by the Lincoln Monument on a chilly 10-miler and getting a solid second wind upon seeing a strong 8:31 split. I saw countless hazy amber sunsets, dodged thousands of tourists (the spot in front of the National Air and Space Museum is a total bottle-neck), and felt the weight of realization that I was blessed to have a place to train that most would consider a bucket list run. It’s true that you have to connect with your trail to be successful as a runner, and while I have those memories of some amazing runs, I had only a few photos that documented my runs there. I felt like this had to change, so I grabbed my Panasonic Lumix camera with its self-timer and 14 megapixels, and headed out the door. My morning started out in Rosslyn where I briskly walked from the Metro station to the Francis Scott Key Bridge that connects Arlington to Washington, DC with a half-mile bridge across the Potomac River. Admittedly, as I passed numerous bike-commuters and pedestrians, I was feeling incredibly self-conscious about setting my camera down on the cement barrier between the fast-moving traffic and the sidewalk to snap a few running photos of myself. Even though the “selfie” has gained significance in the social media world, our society still teases people for taking photos of themselves, and I felt like every car and person who passed me knew exactly what I was doing and were silently judging me for it. Still, determined to get a couple of shots, I set my self-timer, backed up a yard or so, and started running when I saw the camera was about to go off. First attempt– gotta set my Garmin! Second attempt– I backed up too far. Getting a couple of action shots was harder than I thought. First, without the use of a tripod or a human photographer, you only get one angle and that angle is the surface of where you set down your camera. In this case, I didn’t get the prettiest sweeping views of the Potomac or Georgetown cathedral behind me as I was hoping for. Second, it’s hard not to look at the camera as you run past it. I wanted to make sure I was in front of the lens at the exact time the shutter went off, but if you do that, you’ll get the obviousness of having taken the photo using a self-timer. It’s awkward. Third, even the slowest runner will probably run faster than the shutter itself so I had to pause in a weird running position to make sure I got a good shot. So, I didn’t get much luck on the Key Bridge, but I like how the third attempt came out. There’s something editable about the picture. My next stop was along the Mount Vernon Trail, which, if you ever go to Washington, DC, also needs to be on your list of places to run. You get sweeping views of the monuments from across the Potomac River and you can link up to a number of spots in Arlington and Alexandria along the way, including Theodore Roosevelt Island and its mile-loop of trail-running, Arlington Cemetery, and Old Town. Taking photos here was a little bit easier because I wasn’t trying to get anything specific in the photo– just an action shot of myself running where I had spent so much time training. These pictures were for myself. Once I got off the Mount Vernon Trail, I linked up to the Arlington Memorial Bridge. The bridge is pretty busy and is also part of several DC-based races for its unfettered view of the Lincoln Memorial on the east end and Arlington Cemetery on the west end. This is a great place to set up shop. The bridge is pretty much entirely concrete with a lot of ornamental posts along the way, so you have a variety of height choices to choose from that can help ensure you get the Lincoln Memorial in the background. Plus, it comes with the added bonus of using the excuse that you’re here visiting and wanted to get a run in while you saw the sights! It’s a judgement-free zone! 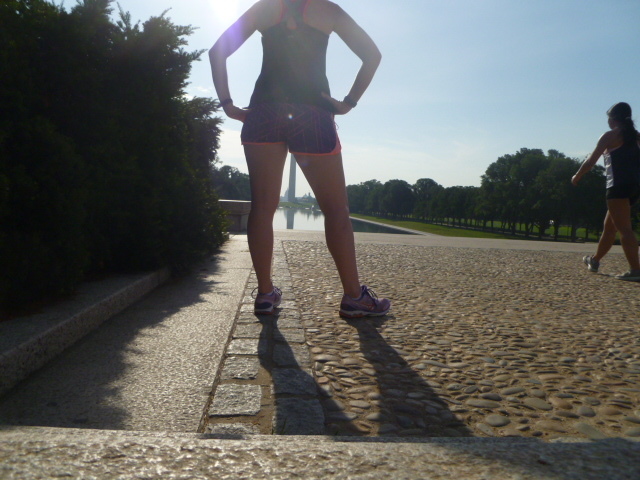 After the Memorial Bridge, I went around to the Lincoln Memorial to finish what was a 3-miler. On a running note, having stopped so many times, my muscles were cooling down and felt pretty tight, so I had to make peace with only getting in 3 miles. But the Lincoln Memorial offers an added fitness bonus: a very steep staircase with narrow steps. Time to run some stairs. Finally, having officially decided that I was done running, I took the time to have some running-selfie fun on the Lincoln Memorial, especially because tourists were starting to show up and I didn’t want one of them to score a free camera. I wish I could end this post with some tips about how to actually take selfies while you’re running, but all I can say is that if you run in a place that is memorable, beautiful, and inspiring, you should shrug off the feeling that everyone is watching and judging you for your vanity and take a selfie. Most people will forget in 30 seconds: no one is that memorable. Maybe just don’t do it so much that your running muscles cramp and stiffen up from all the starting and stopping!